Berlin Cathedral (German: Berliner Dom) is the short name for the Evangelical Supreme Parish and Collegiate Church (German: Oberpfarr- und Domkirche zu Berlin) in Berlin, Germany. It is located on Museum Island in the Mitte borough. The current building was finished in 1905 and is a major work of Historicist architecture of the "Kaiserzeit". The Dom is the parish church of the congregation Gemeinde der Oberpfarr- und Domkirche zu Berlin, a member of the umbrella organisation Evangelical Church of Berlin-Brandenburg-Silesian Upper Lusatia. Berlin Cathedral has never been a cathedral in the actual sense of that term since it has never been the seat of a bishop. 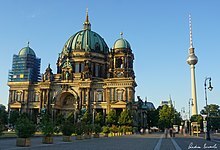 The bishop of the Evangelical Church in Berlin-Brandenburg (under this name 1945–2003) is based at St. Mary's Church and Kaiser Wilhelm Memorial Church in Berlin. Berlin Cathedral has a long history starting as a Roman Catholic place of worship in the 15th century. The history of today's Supreme Parish and Collegiate Church and its community dates back to 1451. In that year Prince-Elector Frederick II Irontooth of Brandenburg moved with his residence from Brandenburg upon Havel to Cölln (today's Fishers' Island, the southern part of Museums Island) into the newly erected City Palace, which also housed a Catholic chapel. In 1454 Frederick Irontooth, after having returned – via Rome – from his pilgrimage to Jerusalem, elevated the chapel to become a parish church, richly endowing it with relics and altars. Pope Nicholas V ordered Stephan Bodecker, then Prince-Bishop of Brandenburg, to consecrate the chapel to Erasmus of Formiae. On 7 April 1465 – at Frederick Irontooth's request – Pope Paul II attributed to St Erasmus Chapel a canon-law College named Stift zu Ehren Unserer Lieben Frauen, des heiligen Kreuzes, St. Petri und Pauli, St. Erasmi und St. Nicolai dedicated to Mary(am) of Nazareth, the Holy Cross, Simon Peter, Paul of Tarsus, Erasmus of Formiae, and Nicholas of Myra. A collegiate church is a church endowed with revenues and earning estates, in order to provide a number of canons, called in canon law a College, with prebends. In this respect a collegiate church is similar to a cathedral, which is why in colloquial German the term cathedral college (Domstift), became the synecdoche used – pars pro toto – for all canon-law colleges. 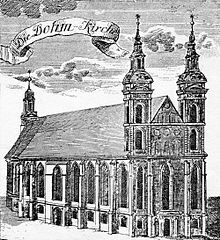 So the college of St. Erasmus' chapel, called Domstift in German, bestowed the pertaining church its colloquial naming, Domkirche (cathedral church). Frederick Irontooth provided the College with estates, sufficient to supply eight canon prebendaries. On 20 January 1469, Dietrich IV, then Prince-Bishop of Brandenburg, invested eight clergymen, chosen by Frederick Irontooth, as collegiate canons with the prebends. The Supreme Parish Church with its double-tower façade of 1538 with northerly adjacent parts of Berlin's Palace. 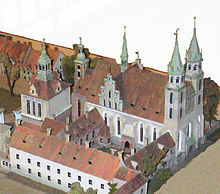 Miniature shown in the present church building. In 1535, Prince-Elector Joachim II Hector reached the consent of Pope Paul III to shut down the 1297-founded Dominican convent (Black Friars), southerly neighboured to the palace, to acquire the pertaining monastic St. Paul's Church, built ca. in 1345. On 28 May 1536, most of the Black Friars moved to a Dominican monastery in Brandenburg upon Havel. Joachim II Hector assigned the thus void, three-nave church building to the Collegiate Church of Our Lady, the Holy Cross, the Ss. Peter, Paul, Erasmus and Nicholas and enlarged the College to 12 prebendaries, bestowing two of them to canons taken on from the Dominican convent. From 1545, on the electoral family of Hohenzollern used the church building also as their burial place. In 1538, a new western façade with two towers was attached to the collegiate church, which – due to its prior status as a church of a mendicant order – had no tower before. In the next year, Joachim II Hector converted from Catholicism to Lutheranism, as earlier had done many of his subjects. The collegiate church thus became Lutheran too, like most of the electoral subjects and all the churches in the Electorate. However, Joachim II Hector's ideas of Reformation were different from the modern ones. After his conversion he enriched the collegiate church with luxuriant furnishings, such as paraments, monstrances, relics, chasubles, carpets and antependia. In 1608, the year of his accession to the throne, Prince-Elector John Sigismund, then a crypto-Calvinist, dissolved the college and the church was renamed into Supreme Parish Church of Holy Trinity in Cölln. In 1613, John Sigismund publicly confessed his Calvinist faith (in Germany usually called Reformed Church), but waived his privilege to demand the same of his subjects (Cuius regio, eius religio). So he and his family, except of his steadfastly Lutheran wife Anna, converted, while most of his subjects remained Lutherans. While Berlin's other churches, subject to Lutheran city-council jurisdiction, remained Lutheran, the Supreme Parish Church of Holy Trinity, the Hohenzollern's house church, became Berlin's first, and until 1695, only Calvinist church, serving from 1632 on as the parish for all Calvinists in town. Being now a Calvinist church, the patronage of the Holy Trinity was increasingly skipped. In 1667, the dilapidated double-tower façade was torn down and in 1717 Martin Böhme erected a new baroque façade with two towers. 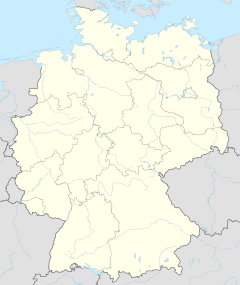 With effect of 1 January 1710, Cölln was united with Berlin under the latter name. 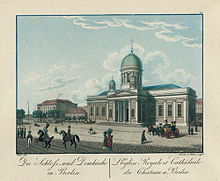 In 1747, the Supreme Parish Church was completely demolished to clear space for the baroque extension of Berlin Palace. On 6 September 1750, the new baroque Calvinist Supreme Parish Church was inaugurated, built by Johann Boumann the Elder in 1747–1750. The electoral tombs were transferred to the new building. The new structure covered a space north of the palace, which is still covered by the present building. In 1817, under the auspices of King Frederick William III of Prussia, the community of the Supreme Parish Church, like most Prussian Calvinist and Lutheran congregations joined the common umbrella organization named Evangelical Church in Prussia (under this name since 1821), with each congregation maintaining its former denomination or adopting the new united denomination. The community of the Supreme Parish Church adopted the new denomination of the Prussian Union. Today's presbytery of the congregation bears the unusual name in German: Domkirchenkollegium, literally Cathedral College, thus recalling the history of the church as collegiate church. In celebration of the Union Karl Friedrich Schinkel remodelled the interior in the same year and in 1820–1822 the exterior of Boumann's church in the neoclassicist style. The Supreme Parish and Cathedral Church faced at its southern façade Berlin City Palace, the residence of the Hohenzollerns (severely damaged in World War II and demolished later by the East German government), and the Lustgarten park at its western front, which is still there. Berlin Cathedral (2018) with the Fernsehturm in the background. However, in the 19th century a new building was under discussion, but the post-Napoleonic poverty made its realization impossible. After dismantling the movable interior (altar, paintings, sarcophagi), Boumann's building was demolished in 1893 and Julius and Otto Raschdorff, father and son, built the present Supreme Parish and Cathedral Church in exuberant forms of high Neo-Renaissance style. 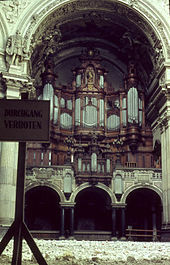 The organ in 1964 – on the floor the rubble of the dome, destroyed in an Allied bombing 1944. With no separation of Protestant church and state of Prussia, Wilhelm II officiated as the summus episcopus (Supreme Governor of the Evangelical State Church of Prussia's older Provinces, as it was named since 1875) and the state paid the complete construction cost of 11,5 million Marks. At 114 metres (374 ft) long, 73 metres (240 ft) wide and 116 metres (381 ft) tall, it was much larger than any of the previous buildings and was considered a Protestant counterweight to St. Peter's Basilica in Vatican City. On 27 February 1905, the present building was inaugurated. In 1940, the blast waves of Allied bombing blew part of the windows away. On 24 May 1944, a bomb of combustible liquids entered the roof lantern of the dome. The fire could not be extinguished at that unreachable section of the dome. So the lantern burnt out and collapsed into the main floor. Between 1949 and 1953, a temporary roof was built to enclose the building. 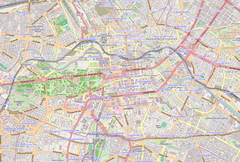 On 9 May 1967 the then still undivided Evangelical Church of the Union decided a committee for the reconstruction of the Supreme Parish and Cathedral Church, then located in East Berlin. The government of the Eastern German Democratic Republic did not oppose the work of the committee due to the concomitant inflow of Deutsche Marks. In 1975, reconstruction started, simplifying the building's original design and demolishing the northern wing, the 'Denkmalskirche' – Memorial Church. Compared by some to the Medici Chapel, it had survived the war completely intact but was demolished for ideological reasons by the communist government due to it being a hall of honour for the Hohenzollern dynasty. This resulted in scaffolding for restoration appearing on the church while detonation charges were applied to its undamaged rear. The government also demanded the removal of as many crosses as possible. The demolition and redesign cost 800,000 marks, while the restoration (done on the cheap) cost just 50,000 marks. The Berlin Cathedral Building Society now seek to rebuild the Denkmalskirche. In 1980, the baptistery and wedding church was reopened for services. The restoration of the nave was begun in 1984. On 6 June 1993, the nave was reinaugurated in an event attended by Federal Chancellor Helmut Kohl and televised nationwide in Germany. There has been discussion to restore the dome and surrounding cupolas to their original appearance, but this has not occurred due to lack of funds. "UNSER GLAUBE IST DER SIEG, DER DIE WELT UEBERWUNDEN HAT." 3 Freie Kombinationen, Mezzoforte, Forte, Tutti, Rohrwerke, Jalousieschweller III. Manual, Jalousieschweller IV. Manual, Jalousieschweller Vox humana, Handregister ab, Rückpositiv ab. ^ Materna, Ingo; Ribbe, Wolfgang; Baudisch, Rosemarie (1995). Geschichte in Daten - Brandenburg. München: Koehler & Amelang. p. 68. ISBN 3-7338-0188-1. ^ Hach, Arno (2002) . Alt-berlin Im Spiegel Seiner Kirchen: Rückblicke in Die Versunkene Altstadt; Mit Einem Plan Der Berliner Innenstadt Um 1860. Ammerbuch: Beggerow. p. 21. ISBN 3-936103-00-3. ^ Among the new revenues additionally bestowed to the collegiate church were the dues to be delivered by a number of soccage farmers in the village of Kaulsdorf and the revenues of its church, however, also obliging the college to fulfill its duties as patron according to the ius patronatus over that church. ^ In 1695 Berlin's second Calvinist church was erected, called Parochial Church, i.e. parish church, as opposed to the Supreme Parish Church then colloquially called Collegiate of Palace Church. ^ From then on Calvinist immigrants, as from Bohemia, France (Huguenots), Juliers-Cleves-Berg, the Netherlands, Poland, Switzerland, and Wallonia were very welcome in Berlin and all the Electorate of Brandenburg in order to build up a considerable minority, being religiously a power base of the Hohenzollern. ^ a b Pohl, Michael, Johann S. Bach, Felix Mendelssohn-Bartholdy, Josef Rheinberger, Max Reger, Max Reger, Max Reger, Max Reger, and Max Reger (1993). Die Grosse Sauer-Orgel Im Berliner Dom (Sound recording). Düsseldorf, Germany: Motette. OCLC 33188606. ^ "Religious artwork, ritual items retrieved from charred remains of Trinity church". Milwaukee Journal Sentinel. Retrieved 2018-09-15. ^ Schnitzler, Katja (6 June 2013). ""Am liebsten hätten sie alle Kreuze verschwinden lassen"" – via Sueddeutsche.de. ^ "Berliner Dom - Berlijn.com". Berlijn.com (in Dutch). 2016-09-19. Retrieved 2018-09-15. Gottschalk, Wolfgang (1985). Altberliner Kirchen in Historischen Ansichten. Würzburg: Weidlich. ISBN 3-8035-1262-X. Kühne, Günther; Stephani, Elisabeth (1986) . Evangelische Kirchen in Berlin (2nd ed.). Berlin: CZV-Verlag. ISBN 3-7674-0158-4. Wikimedia Commons has media related to Berlin Cathedral. This page was last edited on 21 February 2019, at 20:33 (UTC).